All software used for the Prometheus FPGA development board is based on open-source projects. 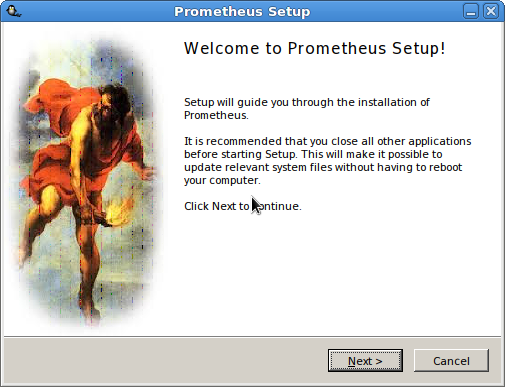 Windows OS users can download Prometheus Installer and start working with the board. The installer includes fireprog, Prometheus GUI and BScan SPI core. Linux OS users can compile fireprog and Prometheus GUI from source. A simple QT-based GUI which passes command arguments to fireprog and runs it in the background. The GUI is based on miniSProg project. A core which uses BSCAN_SPARTAN3 primitive to transfer a configuration bit-stream from JTAG to SPI flash memory. It should be used in pair with fireprog to program SPI flash memory, connected to the Spartan 3 chip. VHDL code is borrowed from Jochem Govers. Constraints (the *.ucf file) were adapted for the Prometheus FPGA board which has an M25PE10 SPI flash. A Windows installer based on NSIS. Only 32-bit version is available. Xilinx ISE is needed to compile VHDL code into *.bit files.